So what was the problem you have identified? My issue is after few basic edits Topaz i instantly crashes and closes. Anyone else have this issue. Possibly slightly off topic, but I’m hoping this makes more sense to you than it does to me! Today I checked for driver updates in GeForce Experience, which told me I had the latest version, but, for the first time ever, it decided to show me where I could change my preferences. I decided to have a look and it seems we can choose from two types of driver: “Game Ready”, which I think is the default, and “Creator Ready”, so I changed to Creator and was given the option to update to version 419.67, which I decided to do. All seems to be working OK - but I’m now wondering which one we should all be using. Any thoughts? Anybody? Possibly slightly off topic, but I’m hoping this makes more sense to you than it does to me! Thanks Paul, I’ll try it later and see if that makes a difference, seems to point towards giving Autodesk, Lightroom etc. a better user experience. Obviously not a really informative message because of the C0000005 error but does point to a old version of .NET which the latest I believe is v4.7. But this may lead to a closer investigation of the condition that, strangely, only occurs with the File-> Open dialog. Where using the OPEN button on the main screen of Studio, or dragging onto the screen works fine… so there is a workaround but it is annoying and has been around for over 3 weeks. YES! Thank you Rondo! Topaz has not worked since I updated my NVIDIA driver about a week ago. I rolled back as you said to do, and voila Topaz works again. I’ve had a ticket in for a few days, I guess I should email back and cancel my ticket? Thanks again! Version 419.67 (dated March 25th) just released … installing now! today came a Nero 2019 update, since then the current Topaz Studio version crashes again. Until the update everything worked fine. I’m staying diplomatic about some software developers now. This time I don’t bother to find the bug anymore, now I’m sitting on another workstation where everything runs on it. On Windows You Thought of Switching to DirectX instead of OpenGL? Apple computers mainly use OpenGL(Adobe PhotoShop and Illustrator)inless Adobe also switched to Metal too. Computers that use NVIDIA are running Windows are not OSX . On Windows You Thought of Switching to DirectX instead of OpenGL? Apple computers mainly use OpenGL NVIDIA computers That Have Windows are not Apple Computers. The applications themselves use OpenGL, Apple has switched to Metal because it provides near-direct access to the GPU. I offer this purely for those with the understanding greater than mine to reflect on these two variants and whether choosing one over the other might make things better or worse when running Topaz software that ‘relies’ on a good GPU & its drivers to get the best out of the software? If you use your PC for playing games choose the Game Ready drivers but if you never play games and use products such as Photoshop the Creator Edition is better as it doesn’t install all the game profiles. @JesusSheep Please, this thread is about NVIDIA and has nothing to do with AMD. If you want to add to the conversation please do. Otherwise don’t go off on to other topics, start a new thread. I have Topaz Studio Also with Above Driver Version GTX 1060 Video Card Now.And a Laptop With same software and GTX 1060. Yes, makes sense and checking a tad more deeply I see that this innovation by nVidia is quite recent…but possibly still relevant to nVidia driver issues in regard Topaz software. Can it be a case in some instances that in the past and maybe in future that Topaz users who also use the same PC to play games are the ones reporting issues with Topaz because of the emphasis on Games in the drivers rather than other software??? 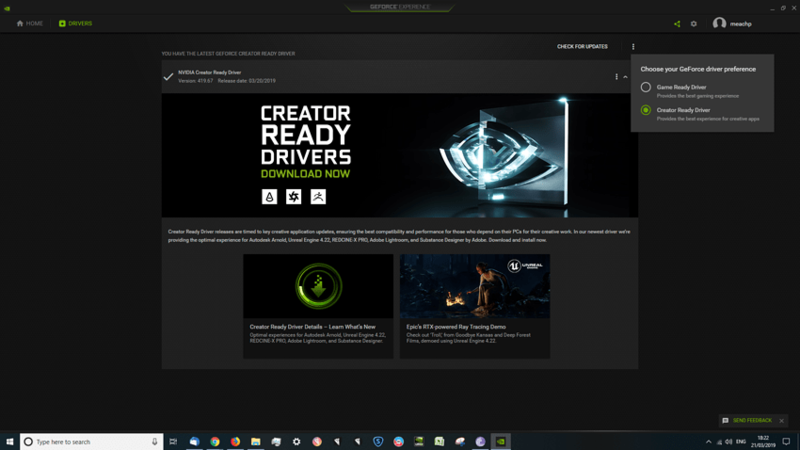 It could well be because some of the work by NVIDIA was driven by close cooperation with ADOBE … but, in my case, the issues I have are not because of games as my PCs are strictly for creative work. I don’t even have any games installed but the Creator versions above 418.81 are still crashing. There is either a timing issue or a .NET issue because the open dialog from the File Menu crashes whereas the open dialog from the center of the display area, which I assume is the same, doesn’t cause a crash. I am more inclined to believed that there is a conflict between the code, .NET and the way in which the NVIDIA GPU is used for the display as well as the processing. In other applications I use, and I believe in PS CC, they only use the NVIDIA GPU for creative work and not display work. For example OS type activities will use the embedded GPU whereas the the high-performance GPU is used for computation and rendering graphics. It is up to the devs to solve this annoyance. Strange to say - and without any games either - my Game Ready nVidia driver works perfectly in Creative Mode.